Several times a week I do a check of our backyard to make sure everything is secure and that there isn’t anything dangerous for the dogs out there. What I’m looking for depends on the season but I check to make sure that the birds haven’t dropped any scraps that they grabbed from our neighbor’s birdfeeder, big sticks, any foreign materials, standing water, holes that Leroy might be digging, rabbit poop and of course, dog poop. In the winter I check for ice and in the fall I check for acorns and mushrooms. The acorns have gotten out of control this year and I can’t seem to keep up with them no matter how hard that I try. The good thing about that is that it seems like my acorn eater (Sherman) isn’t interested in eating acorns as he has in years past. As far as the backyard mushrooms go, I’ve been keeping my out for them but wasn’t seeing as many as I thought I would until we had a weekend of rain. Then they started growing like crazy. I checked the yard on Friday and no mushrooms were seen. I went out Monday morning and found at least 20 mushrooms, 3-4 different varieties. Backyard mushrooms make me extremely nervous because when I worked at the vet clinic we would see a lot of dogs come in with mushroom poisoning and one of those dogs was Sherman. 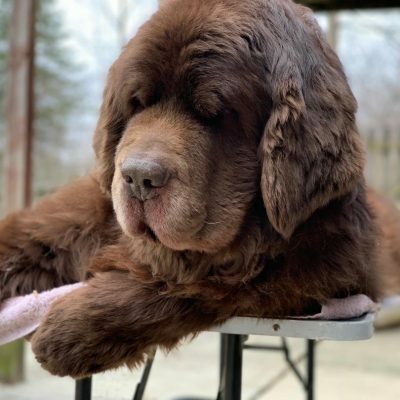 Thankfully, Sherman didn’t eat a mushroom that would kill him but he did eat a mushroom that made he foam profusely from the mouth. I rushed him to the vet clinic and he was monitored overnight and thankfully didn’t show any signs of toxicity. But ever since then I’ve been crazy obsessive about checking the yard. Fall is prime time for mushrooms to grow here in Ohio and we get a variety of mushrooms in our yard. I don’t play around with leaving them, as soon as I see them, they are gone. While not all wild mushrooms are toxic to dogs, there are several mushrooms that grow right in our own backyards that are. 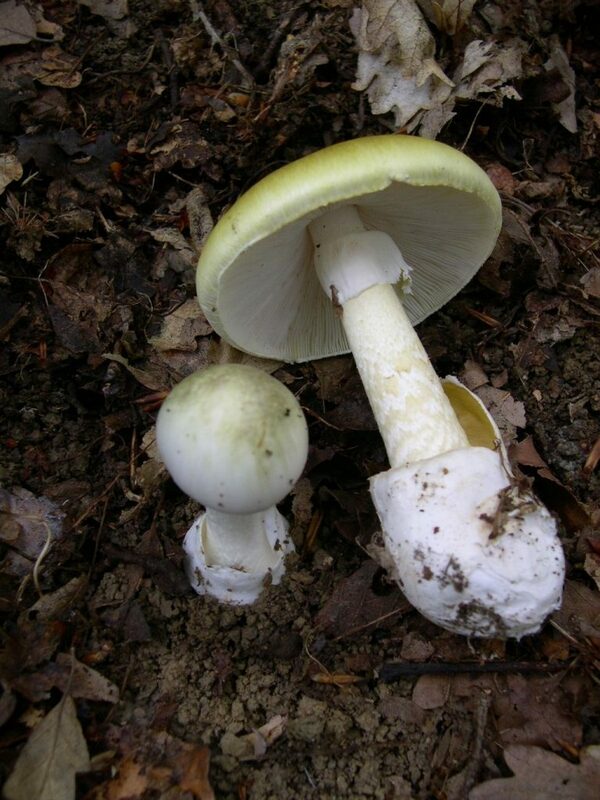 According to the North American Mycological Association (NAMA) most dogs tend to be drawn to two poisonous backyard mushrooms that have a fishy odor to them: Amanita phalloides (Death Caps) and Inocybe. These mushrooms have a compound in them called muscarine that can be deadly to dogs but perfectly safe for humans. 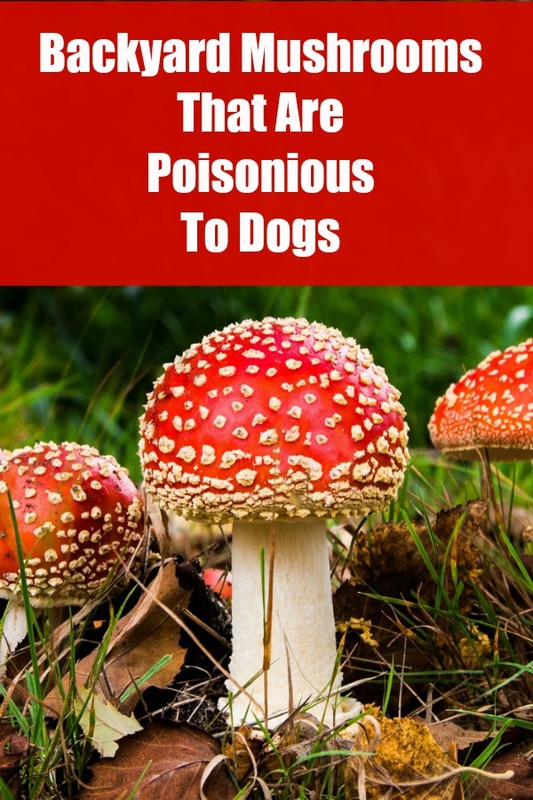 The Amanita muscaria and Amanita pantherina can also be toxic in dogs and they contain toxic compounds ibotenic acid and muscimol. The Scleroderma mushroom can also be toxic to dogs but it is unsure what the toxic substance in. 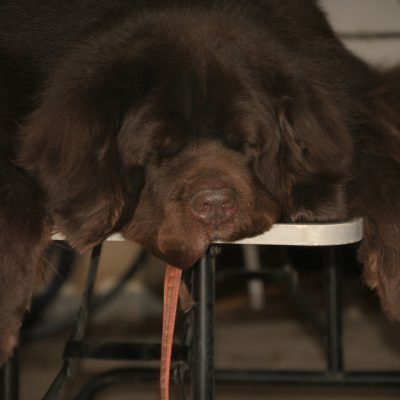 Backyard mushroom poisoning in dogs depends on what type of mushroom that the dog has consumed. Some signs of mushroom poisoning in dogs can be GI irritation that includes vomiting, diarrhea, pain in the abdomen and excessive drooling. Other signs may be lethargy, excessive tear production, small pupils, yellowing of the eyes and mucous membranes, slow heartbeat, seizures, liver damage, and coma. Treatment for backyard mushroom poisoning in dogs will depend on the signs and symptoms that the dog is showing. Immediate veterinarian care should be sought if someone suspects that their dog has consumed a mushroom and is showing any of the signs above. Sometimes a veterinarian may induce vomiting depending on how long ago the mushroom was consumed. The best way to prevent mushroom poisoning in dogs is to do regular checks of your backyard and remove them immediately. I’ve also been trying to keep our grass trimmed short so that it can dry out easier after a heavy rain. 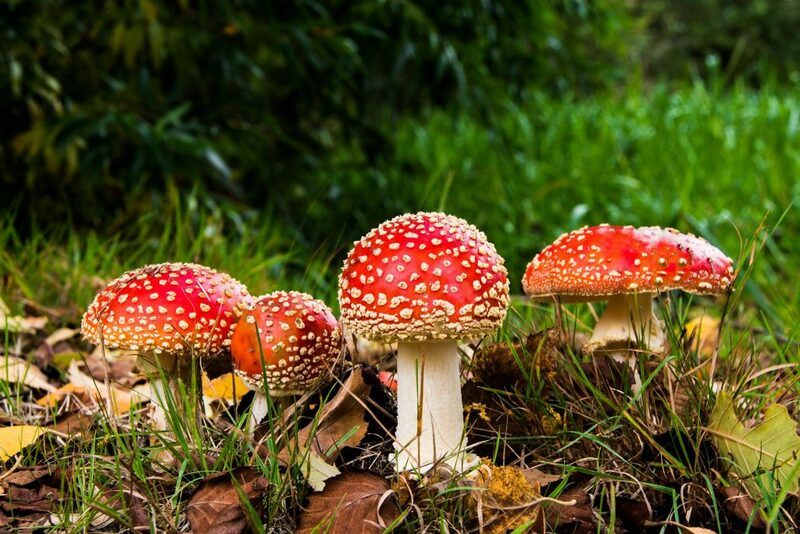 Most veterinarians will consider any backyard mushroom poisonous unless it can be easily identified as a safe one. 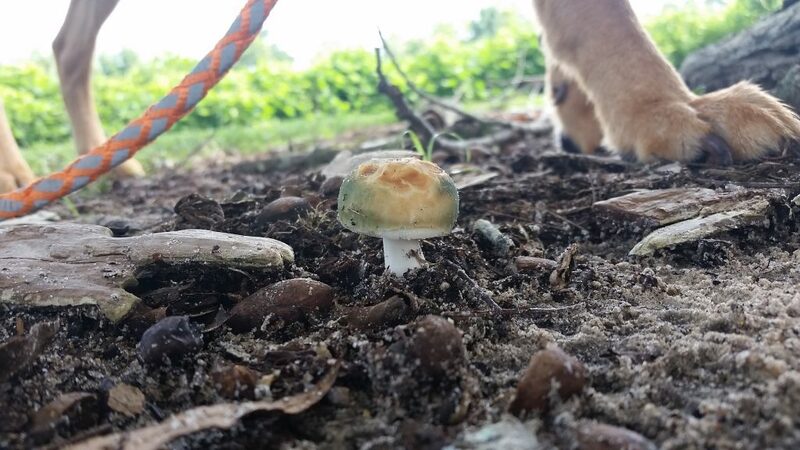 Mushrooms can also be found in other areas that dogs frequent such as dog parks, on hikes, and along sidewalks. Please make sure to be checking your yard at this time of the year. Dogs die every year from mushroom poisoning and I’ve known way too many. Our local news station just did a report that says 30 people have recently become ill from eating mushrooms in the Ohio area. 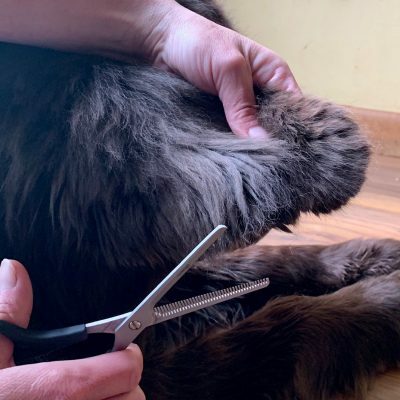 This is an informational post only and does not substitute for veterinarian advice. To identify a possible poisonous mushroom by state visit NAMA. Yikes! Thankfully it’s rare there’s ever enough humidity here to sprout mushrooms. Stay safe! There was another pet blog we read where one of their pugs died of mushroom poisoning. I never forgot that. 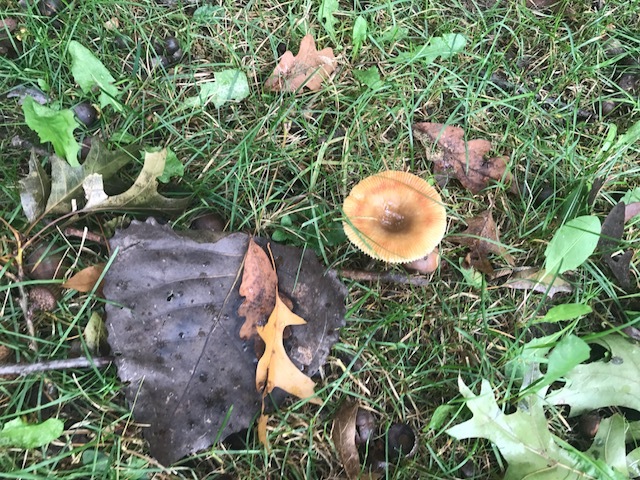 We have had a crazy wet late summer/fall, and there are days where the mushrooms seem to pop up overnight in our yard. I scoop them right up when I’m scooping poop in the yard (our shovel/rake tool works great for that!). We walk in our woods, and I can’t believe how many different mushrooms we’ve seen out there. There must be a billion different species! I watch Luke closely and pull him away if he starts to sniff any mushrooms. This is a great post, because I imagine a lot of people are not aware of the dangers.